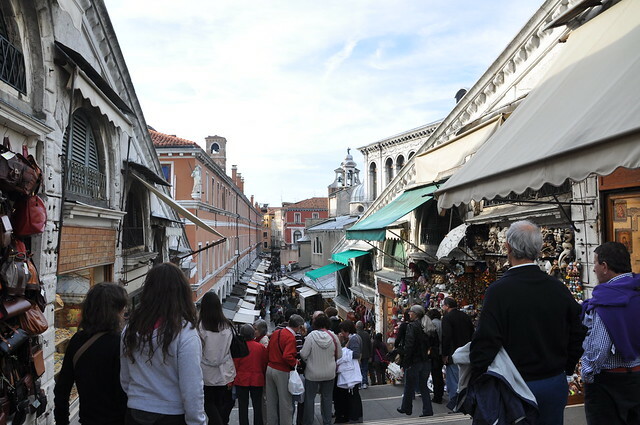 Fazendo um apanhado das imagens mais emblemáticas que vi de Veneza antes de a visitar, podemos sempre ver as gôndolas, a Piazza di São Marco com a Basilica, várias do Grand Canal e claro, a Ponte de Rialto. 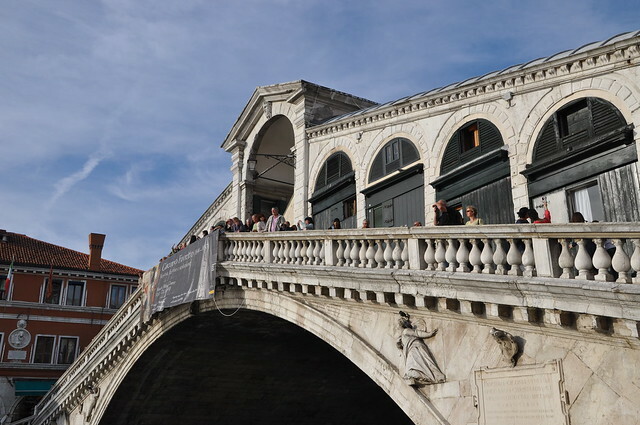 Esta ponte em forma de arco é uma das mais antigas e também um dos símbolos de Veneza. Pareceu-me que ela é a grande embaixadora da essência do passado (e presente) mercantil da cidade, porque não servia apenas de passagem ou para ligar dois bairros da cidade, ao passar por ela entramos num pequeno centro comercial com lojas de um lado e do outro. 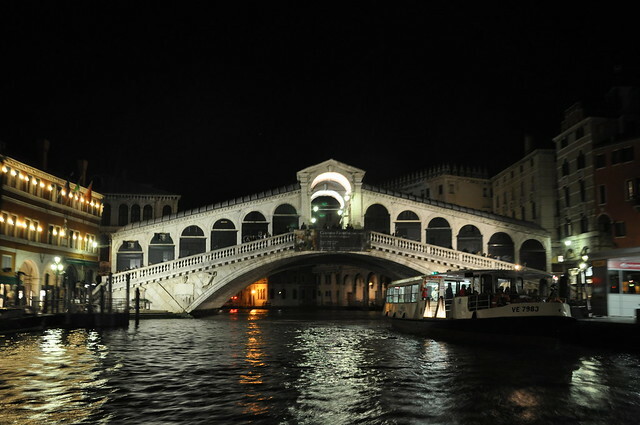 If I think about the most notorious images I saw of Venice before visiting you could always see the gondolas, the St. Mark’s square and the Basilica, lots of pictures of the Grand Canal and of course, the Rialto Bridge. With arch shape it is one of the oldest of this city and also one of it’s icons. It looked to me as she represented the essence of the merchant past (and present) of the city, it wasn’t just used to connect the two sides of the Grand Canal, passing through it we get in a small shopping centre with stores on both sides. 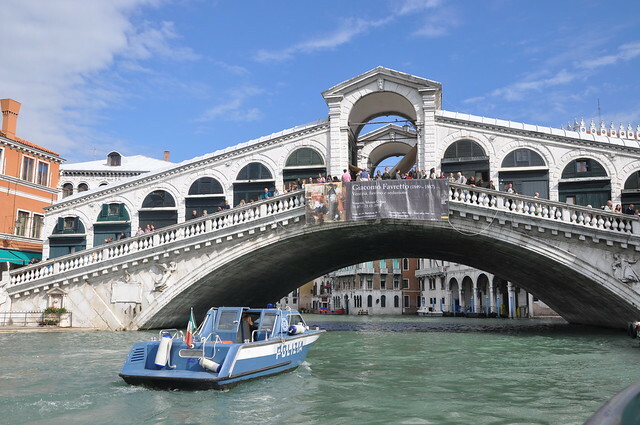 Foi durante muitos anos a única forma de cruzar o Gran Canal até que no século XIX construiram a Ponte della Accademia. A sua primeira construção é do século XIII e era em madeira e no século XV foram construídas pequenas lojas na sua passagem. Pela fragilidade do material utilizado, a ponte não sobreviveu a incêndios e quedas, assim que decidiram por uma construção em pedra para garantir a segurança e longevidade da ponte. Ficou completa em 1591 e o seu nome vem do famoso mercado que está ali perto. Nós conhecêmo-la de duas perspectivas, a primeira foi na nossa passagem pelo Grand Canal a bordo do Vaporetto e a segunda foi passando por ela, subindo os seus degraus e apreciando a sua agitação. Mas há outras, uma que atrai muita gente é jantar numa das esplanadas com vista para a ponte. 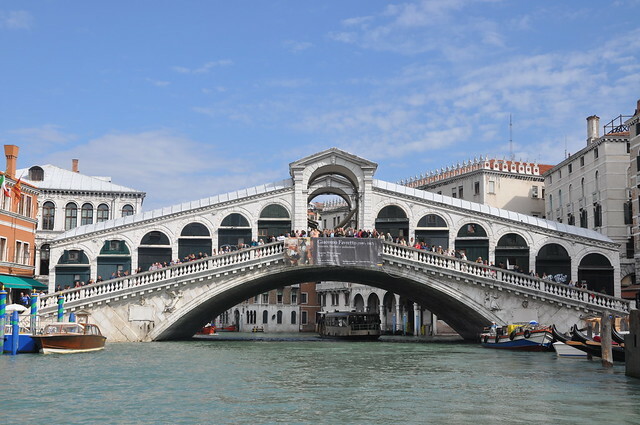 For many years it was the only way to cross the Grand Canal until when in the XIX century they built the Accademia bridge. It’s first construction is from the XIII and is was made of wood, on the XV small stores were built on it. Due to the fragility of the materials used, the bridge couldn’t survive the fires and colapsed, so they decided to built another one in stone to ensure it’s safety and longevity. 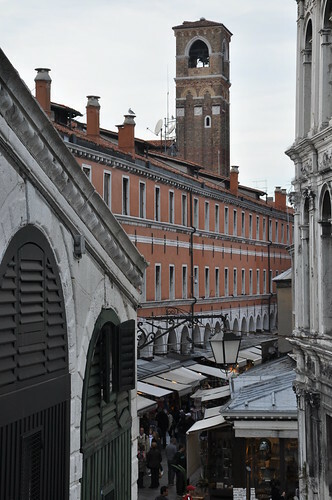 It was complete in 1591 and it was named after the famous market that is close by. 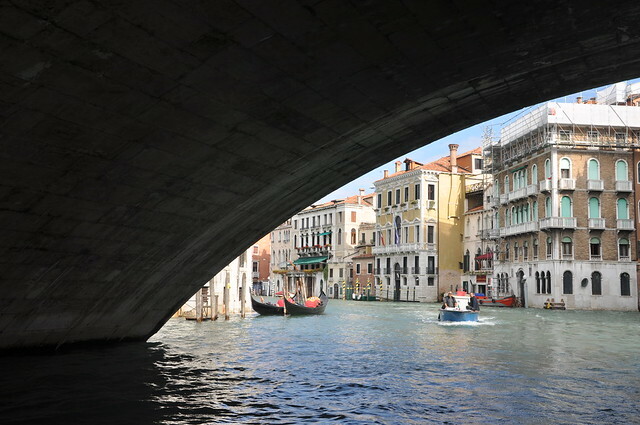 We saw it from two perspectives, the first was passing through the Grand Canal on a Vaporetto and the other one was crossing it on foot, climbing it’s steps and enjoying the buzz. But there are others, one that many people do is have dinner on a nice terrace with a view to the bridge.